love the floor tile - HI, Where is the hexagon tile from? Love the wall tile! Where is it from? The shower walls are Tilebar Lancaster Driftwood 3x12 and Dove 3x6. The paint color on the walls in the bathroom is Sherwin Williams 7668 March Wind, if you are asking about that. Great tile! - Can you tell me the grout color you used? The grout color is #544 Rolling Fog. Rolling Fog is a Custom Building Products grout color. 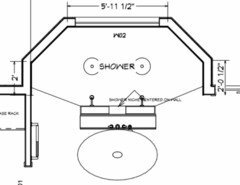 Shower dimensions? - Gorgeous! I would love to know the dimensions of this shower please. Thanks! The back wall with the window is 6'. Here's a clip of the floorplan. Wall tile - What is the wall time and grout color? 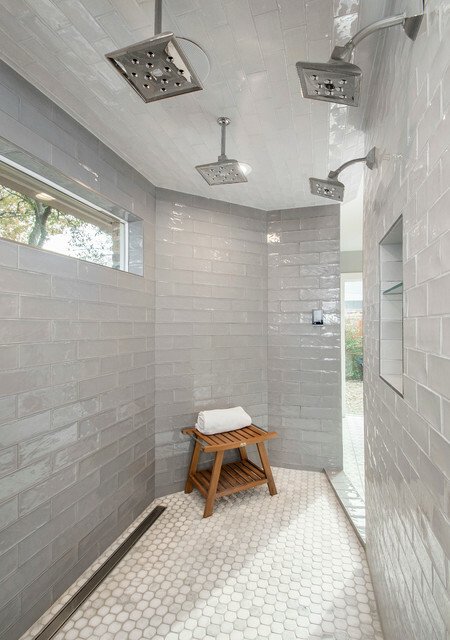 This tile is from The Tile Shop, Bulevar Gray 4x12 Glossy. The grout color is rolling fog. Shower Window - Hello, I love the window in the shower. Can you tell me the dimensions? Thank you. Hi! This window is 60" x 18"
Where is the subway tile from?? - That's not a flat subway tile...seems to have a wave/texture...what's it called??? Hi, these are from the Tile Shop, they are called Bulevar Gray 4"x12" Glossy and you are right, the tile isn't exactly smooth or straight edges. It has a handmade look to it and a wavy surface.